The Tourist Map of Taiwan. This is an uncommon and unusual bi-lingual tourist map of Taiwan or Formosa Island dating from 1952. It covers the entire island in great detail marking various cities, railways, roads, rivers and various other topographical details. Published soon after the forces of the Republic of China established themselves in Taiwan, this map notes place names in Chinese and in English. A legend listing the 'Marks for the Map' is set in the lower left quadrant. The map is issued to the scale of 1:600000. 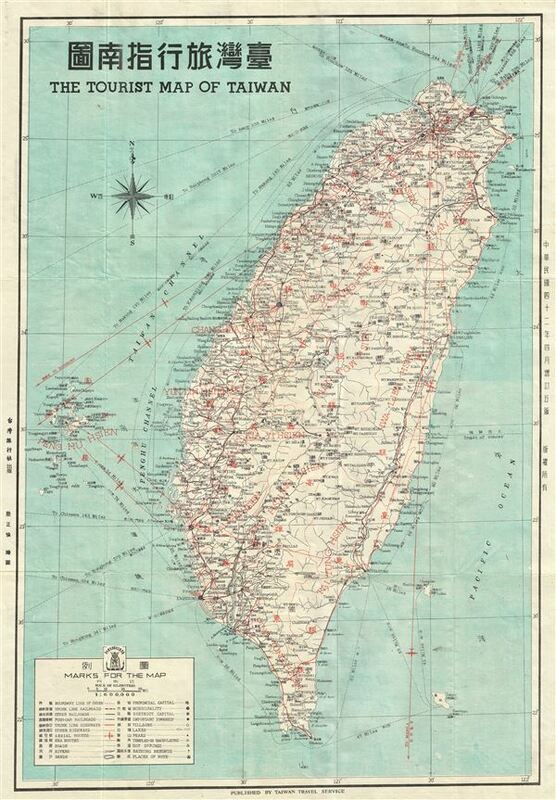 This map was published by the Taiwan Travel Service in 1952. Very good. Minor wear along original fold lines. Blank on verso.